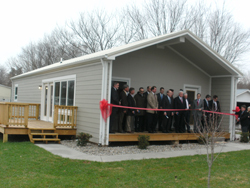 A ribbon cutting on January 27 near downtown Monticello, Ky marked the completion of the first prototype from the University of Kentucky's Houseboat to Energy Efficient Residences (HBEER) initiative. 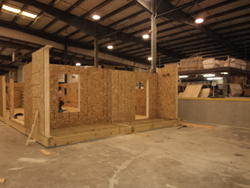 The initiative is designed to taking a suffering Kentucky industry (houseboat manufacturing) and revitalize it with a new, necessary product - energy efficient homes. 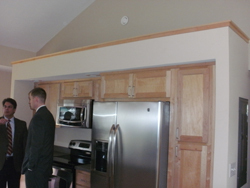 According to Jerry Rickett, president of Kentucky Highlands Investment Corporation, "the HBEER prototype reached a Home Energy Rating System (HERS) rating of 53 which has been achieved through the use of Structural Insulated Panels (SIPs) walls rated at R-29, roof and floor systems both rated at R-41, high quality windows and doors, and other energy efficient materials and techniques." 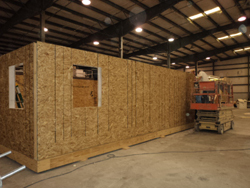 Fischer SIPs was proud to be a part of the project which will supply a much-needed alternative for low-energy housing in rural Kentucky, and also supports Kentucky's ecomomy. 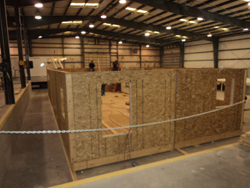 82% of the parts and labor for the initial prototype came from Kentucky businesses. Special guests such as Fifth District U.S. Congressman, Harold 'Hal' Rogers, Lt. Governor, Jerry Abramson, and University of Kentucky President, Dr. Eli Capilouto made the special day a true celebration.